Much of our print and digital design work is complimented by compelling images. Great campaigns might only need one, while a set of brochures is helped by a few dozen. They can add a touch of real life to abstract concepts or evoke a visual feeling about the subject. Like any other part of the project, we work with parameters allowed: time, budget, authenticity and quality. 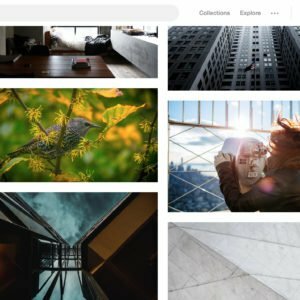 How can you find the best photos for your project? Here’s a designer’s perspective on where to go. Where do you go when you need something quick and free? Not here. 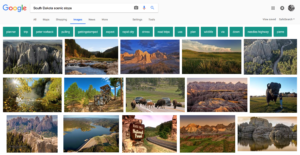 Google images, Bing images, Facebook, Pinterest are places to visit when searching for inspiration, but will rarely yield an image you can legally use. Taking someone else’s image is copyright infringement (Learn the basics here). The only time it’s okay to use a search engine to find photos is when compiling ideas. Even then, it’s important to remember to replace the ones you found in a basic search with a photo you have a license to use before your project is published or shared. There are a few places to find licensed quality photos for free online. These can be great for background photos and for social media posts if you have a limited budget. You may not find exactly what you’re looking for, however, and other people may be using the same photos. 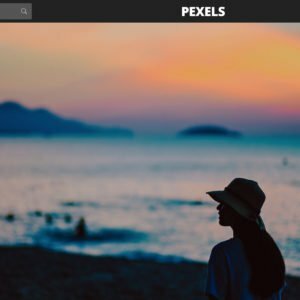 Pexels: Pexels provides a wide variety of photos and is simple to search. The quality and selection of photos continues to grow. The downside? The secret is out and you may find other businesses using the same photos for different purposes. There are no advanced search options, so it may be tough to find exactly what you’re looking for. Unsplash: Warning! These photos need attribution and may not be the best option for your project. Unsplash was a reaction to obviously staged stock photos. (You know, the ones featuring someone in a business suit in an unlikely and totally staged situation. You’ve seen them, you know.) But now it’s created a new kind of cliché: the hipster stock photo of woodsy landscapes and moody vibes. Background images are abundant here and it might be a good place to find ideas. 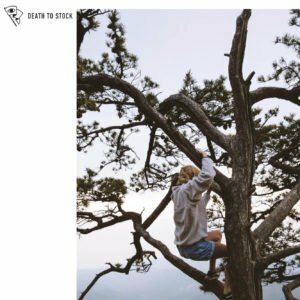 Death to the Stock Photo: They take a similar approach to Pexels and Unsplash, but instead curate photos into themed packs for free users and emails them out in a newsletter or subscription-esque model. These photos are always interesting but pop up frequently in other people’s work. Flickr commons: Anyone can contribute to the growing nebula of the photo stockpile that is Flickr. Use this platform with caution! Only photos listed with a “Creative Commons” license can be used without attribution. While the photo selection is wide, the quality varies greatly from professional photography to archaic digital camera photos. We have been able to take advantage of some of the vintage artwork (posters, illustrations and books) that can become part of a larger classic look or feel. Most paid sites offer the best advanced search options and perhaps the largest photo selection. Want a photo with one Asian man in his 60s on a fishing trip? You got it. Want a photo of a group of people camping in the wintertime? Done. When a project calls for specifics (i.e. a man old enough to have cataracts enjoying his daughter’s wedding without glasses because his cataract surgery eliminated their need), paid stock photo sites are the fastest and most cost-effective way to get the job done. They all have advanced search options that let you choose whether you want a photo with people, how many people, plus their age, gender, even ethnicity. 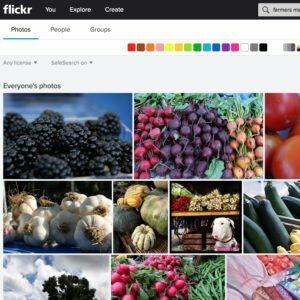 Most sites also allow you to search by hex color code so you can find a photo that has elements that match your brand colors perfectly. A license for this photo has been purchased and it’s ready for use! 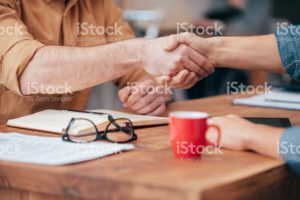 Stock photo sites also make it easy to test out an image by downloading it with a watermark. Many early drafts contain watermarked images until they get approved. Using a watermarked image in final artwork is a huge faux pas. This photo uses a spot-color effect so that it can feel like part of a set. Other photos in the set of brochures where this one was used have a similar red pop. Some stock photo models are more successful than others at portraying a natural look and end up all over. The same woman in your ad might end up getting used to advertise hand soap or athletic apparel or a prescription medication. Stock model Ariane, for example, is so popular that someone created a Facebook page to collect examples of her photos as people came across them all over the world. I provided just a few examples; there are many places to buy stock photos online. 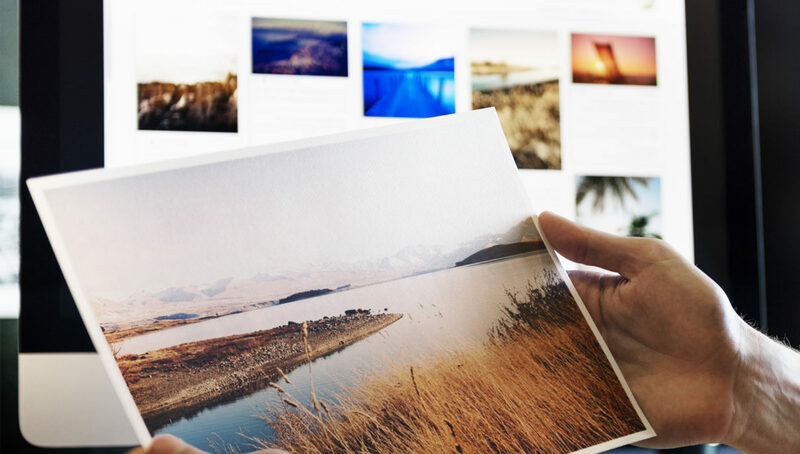 Prices vary based on the number of photos you purchase at a time, the quality of photos, and whether you want to buy exclusive rights to a photo. You can spend anywhere from around $10 to hundreds on one photo. …work great for social media post or email newsletters. In fact, they may be more interesting to your audience than stock photos. Cameras on smart phones have improved greatly in the last few years. If you can capture a photo with good lighting that’s social media or newsletter appropriate, it will nearly always beat out a stock image. Examples: Your office holiday decorations, a staff birthday celebration, your company-wide service or community event. These photos need to feel real and this is the fastest, easiest way to produce digital sharing-ready photos. Someone on your team might already have a repertoire of good phone photography skills. Check their Instagram and see if they’re willing to be on-call when something post-worthy happens. …do not work for most print publications. 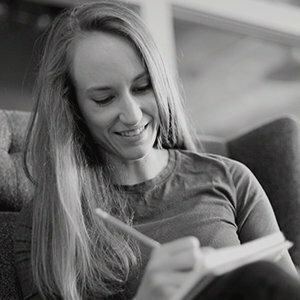 While you may have captured a great candid of your company’s founder interacting with a new employee, it may not be the thing for your brochure cover. Photo quality—both in content and file size—are important here. Phone photos may not have a high enough resolution to make it beyond Facebook and usually have no business on a postcard, brochure or banner. 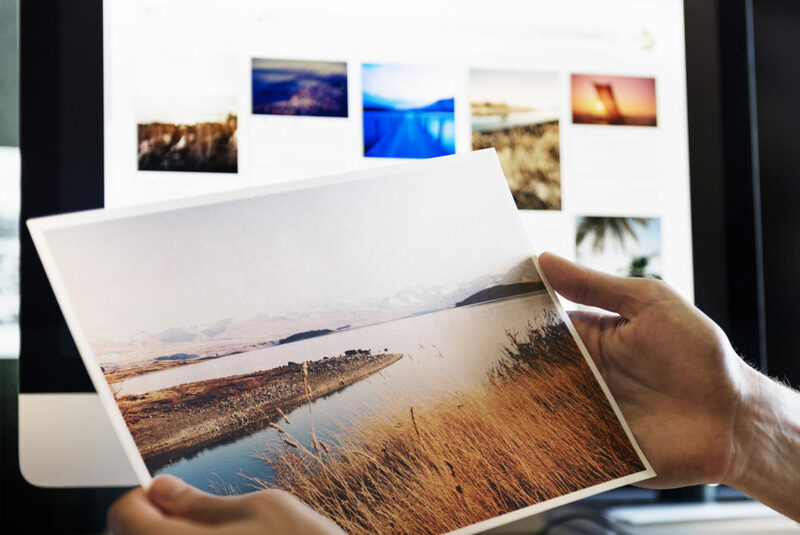 There may be an obvious difference between a phone photo sitting next to a stock image or the resolution may simply make the image pixelated on a paper. Either way, the quality of the materials that promote your work should match the quality of the work you are doing. So, when is the real thing better than a good photo? It all depends on what your audience needs and expects! An ophthalmic surgery center might share a phone photo of a surgeon using a brand new technology but needs a professional photo for their brochure about it. A non-profit that helps local kids is better off sacrificing photo quality for authentic images of their experience (with permission of course!). An employee of Vance Thompson Vision sits in as a cataract patient model. The photo was used for a presentation by Dr. Thompson and it was important for the photos to feature their clinic. 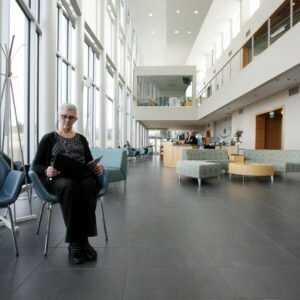 Perhaps the best way to help patients or customers understand what their experience will be like with your business is to create your own custom photos. With a custom photo shoot you get to feature images of your actual business. (Crazy, right?) Instead of showing an image of a clean, empty reception area, why not feature a photo of your reception area? The familiarity helps build trust and confidence with a patient or customer’s first encounter at your facility by evoking a, “hey, I’ve seen this before,” reaction. The same rules apply for shots of your doctors or employees. They may feel static and posed in a headshot, so creating a scene with a patient or customer interaction not only helps puts them in their element it also creates a more realistic image to put online or in a brochure. As a bonus, you won’t be using a stock photo model in place of your professionals and the whole set will have the same tone and feel. For obvious reasons, you should not use real patients in these photo. You’ll need to have everyone’s permission (with model release forms) to pull this off successfully. You may not need to invest in a photo shoot to be able to use excellent, local photography. Many professional photographers have already invested time in capturing the surrounding landscape and local landmarks.Vance Thompson Vision, for example, uses photos of South Dakota taken by local photographer Paul Schiller. 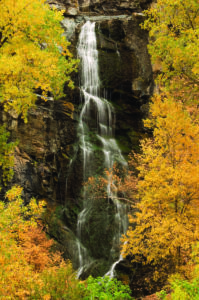 His landscape photography features popular natural landmarks like Lake Sylvan and Bridal Veil Falls. They help unify a series of brochures on the various eye procedure categories available at Vance Thompson Vision. While there are many ways to do it, finding the right photo shouldn’t be overwhelming. Like most design projects, it starts with identifying the image’s purpose, the available budget and time, and how it fits with the existing brand. Photography tells a huge part of a brand’s story. Used well, it reinforces your message and catches the eye. Happy photo hunting.